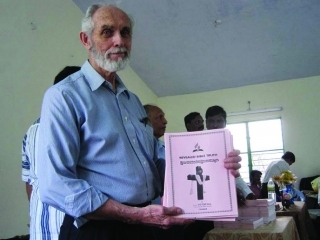 In January and February 2010, Pastor Victor Gill and Mark Kiefiuk visited India on a mission trip. The following is their joint report of the experience of God’s blessing and leading. Victor: Mark and I left for India on January 15. The plan was for us to preach to non-SDA pastors in three different cities—Bapatla, Ponnuru, and Vinukonda. Our plan was to spend five days in each place, preaching four messages per day. Mark: On Sabbath, January 16, we met a young man in Hyderabad named Praveendas and his uncle, Pastor Caleb, from Bapatla. We drove with them until midnight to the Bapatla area where would begin our meetings with the pastors. On Sunday, January 17, we met Pastor Caleb’s brother and Praveendas’ father—Pastor Yesusdas—who was in charge of arranging our meetings. He was a medical worker in the government before he became a Christian. He first became a Baptist and then an Adventist. God put a dream on his heart to have a pastor from overseas to come and preach to non-SDA pastors, because he has a lot of friends and has good connections with the pastors from other denominations. Pastor Yesusdas has an incredible family. His son Praveendas works with the government as an accountant. He also has some incredible connections with prominent leaders in India. Up until now, we had been going over to India with only tourist visas. However, Praveendas arranged for us to have a full 5-year visa to India to preach, teach, and build. This is a rare privilege given to very few organizations operating in India. So many Seventh-day Adventists have been going to India on tourist visas to do evangelism and been detained or sent home because of this issue. Due to the influence of this family, any evangelist sent by Amazing Discoveries to India will now be permitted to legally preach, teach, and build in that country. We are praising the Lord for how He is leading! Victor: What a wonderful family—full of honesty, integrity, and educational skills. Pastor Yesusdas is a Regional SDA Pastor over 42 churches, and his two sons have state government positions, are fluent in English, and able to translate with speed and accuracy. Pastor Caleb is a seasoned Adventist pastor with administrative skills, and gave strong leadership and organization. We weren’t long into the preaching mode when Mark said to me, “Pastor, you do the preaching, and I’ll do the praying. God is richly blessing your preaching.” I agreed. Mark is a real prayer warrior. I appreciate his companionship. God richly blessed both our efforts, as I preached up to six hours a day, and Mark continued to pray for me. God heard and answered his prayers, along with yours I am sure. 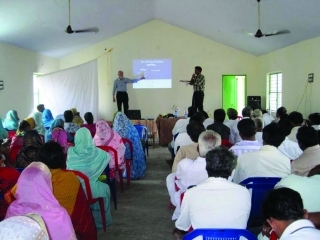 Over two hundred non-SDA pastors came for the meetings, and stayed for one week. We housed them and fed them. The Holy Spirit impressed their hearts with truth. Many gave personal testimonies of their convictions. Mark: On Monday morning we had over 167 pastors and their wives attend our first meeting. Also during our time there, we moved from a hotel into a beautiful old government agricultural farm area in the country. We had a lizard as a pet. It stayed with us the whole time and assisted in keeping the mosquitoes away. God really blessed. We continued the meetings on Tuesday, January 19, and the attendance continued to grow as more Sunday-keeping pastors and their wives started to attend. Pastor Gill preached three meetings on Monday and five on Tuesday. He preached an average of six hours per day to these pastors and they never got restless. They continued to come and to respond more each meeting. Victor: By Wednesday, January 20th, the meetings had grown to the point where people had to sit outside. I covered four sermons. After the second sermon, which was on the Sabbath, an uprising started to take place. One man stood up and challenged me. As he asked a question, I opened my Bible to answer it, but another man stood up and started yelling in Telegu for the people to leave. Everyone started yelling and pretty soon the whole place was in an uproar. We dismissed the meeting for a break. After 20 minutes, about 95% of the people came back into the meetings. God moved. There was a lot of tension but I preached another message on the two covenants and the change of the Sabbath from Daniel 7. Mark continued to pray earnestly, calling out for God’s Spirit and His angels to stop the Enemy from distracting these meetings. Mark: At the end of the meeting, Pastor Caleb stayed to talk to the ministers. He offered 100,000 rupees to anyone that could show one text in Scripture that could prove that God changed the day of rest from Sabbath to Sunday. Of course, no one came forward. Victor: On Thursday, January 21st, I preached three meetings, beginning with the subject of the Mark of the Beast. We had an incredible attendance. It was larger than ever. Everyone came back, even the men that caused the uprising. We had over 100 Sunday-keeping pastors and their wives. Mark: While the message of the Mark of the Beast was preached, you could hear a pin drop even though the sermon was 2½ hours long. We could see the hearts of people being moved as heads were nodding in agreement. The Holy Spirit was moving in a mighty and powerful way. When we stopped for lunch, the man that started the uprising came to apologize to Pastor Gill. It was incredible to see him praying with Pastor Gill. Praise the Holy Spirit for moving upon that man’s heart. Victor: It was wonderful to see the Holy Spirit’s work of restoration when the man came to apologize to me. Mark: Some of the messages were difficult for the people to accept. Commotion arose a second time, but again, through prayer and the influence of our Adventist brethren and others who supported the message, peace was restored again. Christopher, a lawyer and Christian from Hyderabad, came up to meet with us on Friday. He is not a member of the SDA church, but loves the Lord and believes the message about Sabbath he heard Pastor Gill preach about three years ago. He has been instrumental in arranging both last year’s meetings and this year’s. He is very much involved behind the scenes and a well-respected man. When he heard the commotion that was taking place, he was stirred and spoke for about half an hour to the pastors. It was a powerful message that only served to impress the crowd further that the message they were hearing was the truth. Pastor Gill then preached the final sermon on the unpardonable sin. He preached about two hours. He asked for a show of hands of who accepted these truths and 50% raised their hands. It was an incredible ending for this week of meetings. Victor: The brethren in Bapatla asked me not to go on to the next city, but to stay and hold evening meetings to preach to their members the truths they had received. Then the Conference conference officials asked if I would teach the SDA pastors as well. Seventy-five pastors came and I preached to them four messages a day and to the whole group of 400-500 every night. God blessed in a wonderful way. Two Sunday-keeping pastors and 158 of their members were baptized and we started two new SDA churches in that area. Mark: Also during these meetings, Pastor Daniel from Rajmundry came and visited us. He shared that after we left last year, he took Pastor Gill’s outlines and shared them with Sunday-keeping pastors. Victor: Pastor Daniel wanted these men to come and hear what he heard last year and catch the vision as he did. And that’s exactly what happened. These men couldn’t wait to go back home to start preaching the message to others. The brethren there continue to follow up, and only God knows the end result. This is a fruitful area and these brethren are working now to prepare 50 other villages for us to return and do likewise in November of this year. How can I say no? In fact I am looking for several volunteers to come with me to preach to as many people as possible. I was talking to one of the pastors recently and he tells me that twelve other non–SDA pastors and their churches converted to Adventism. Praise God! Mark: We also enjoyed going for a walk every morning and meeting the ladies who work in the neighboring fields. We had the opportunity on those walks to witness in a small way to these Hindus and some Christians. After a week of us being there, they knew that we were Christians and some started to come to Pastor Gill for prayer. A scientist working at the farm came to talk with Pastor Gill, and he shared and prayed with her. The farm’s caretaker also came asking for prayer. We handed out books to these people and saw them reading and studying as if they were looking for hidden treasure. One day someone came running to Pastor Gill and asked him to come to the nearby home of one of the villagers. He went with the man and was brought to a young girl writhing on the floor and foaming at the mouth. He was told that this child would often have these fits and that sometimes they lasted for days. Pastor Gill immediately knelt down and began praying for her. He wasn’t sure whether this seizure was purely biological, or if it was demonic. He prayed and asked the Lord to heal her and to break the hold of Satan and free her. When he opened his eyes, she was smiling up at him and the seizure was gone. The parents were so happy that their daughter was healed. As far as we know she has never had a seizure since that day. This news was spread all over the area. While Pastor Gill was in India he had many opportunities to pray for people. He doesn’t know how many of them were healed, but this one was immediate and dramatic. On Sunday, I headed to the airport and flew home to prepare my home church for an evangelistic series. Pastor Gill stayed behind and continued to preach in the tent meetings until February 11. Victor: We have made progress in other areas as well. All my audio sermons are now being transcribed and printed in book format in Telegu, the local language. 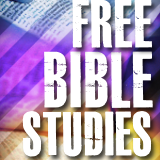 When it is published, people will have our whole message in their own language and we will give those books out free in future evangelistic meetings. It’s an awesome experience to be part of the finishing of God’s work in the earth. Those of you who have had a part by your giving and making it possible will share one day in the joy of seeing souls in the kingdom. I personally want to thank you for your gifts and your prayers, and pray the Lord to richly bless each of you in every way for your support. Mark: All praise goes to God. He led on this trip in 2010 and we look forward to going back to India to work in His vineyard. His unworthy servants, Pastor Victor Gill and Mark Kiefiuk.